There is another theory that has Mars as a moon of some other body with one side of Mars always facing this other body just like the Moon and Earth. Then there was a constant discharge between Mars and this other body which eroded away one side of Mars. moses wrote: There is another theory that has Mars as a moon of some other body with one side of Mars always facing this other body just like the Moon and Earth. Then there was a constant discharge between Mars and this other body which eroded away one side of Mars. Why was only one side of Mars facing this hypothesized primary (perhaps prior to the hemispherical imbalance caused by EDM), and what gave Mars the rotation we see today? There are many hypotheses about the formation of the Solar system, or at least earlier epochs in its history. Tom Van Flandern suggested that the planets fissioned out of the Sun in pairs, and that the debris of an exploding planet gave Iapetus its half-and-half coloring. If catastrophic events of such magnitude have occurred, it may not be possible to work out a detailed history of the Solar system beyond the most recent discontinuity. Again, only one side of the Moon faces the Earth. So if conditions became very electrical there might be a discharge between the Earth and the Moon which could etch away one side of the Moon only. Mars might have been in an orbit that took about 24 hrs to do I lap of this other body. Upon escaping this other body the 24 Hr rotation would continue. And Mars and Earth might have interacted sufficiently to bring their roatations to the same amount, nearly. There at untold theories about planetary interactions, but this is not the place to go into them. But there are geological clues that help us form theories, like the layered sediment on Earth. It is a very interesting subject, but not here. moses wrote: Again, only one side of the Moon faces the Earth. So if conditions became very electrical there might be a discharge between the Earth and the Moon which could etch away one side of the Moon only. The Martian hemispherical differences in topology and elevation do present a mystery to astronomy. Much of the Martian terrain has no Earthly analogue. Something did it. But what? You're positing a situation in which a satellite body (the Moon) is already locked with one face towards its primary, and where that body already has an eccentric shape. Yet your original premise was a symmetrical body already locked with one face to its primary, then becoming unbalanced due to EDM. Cart before horse? Mars might have been in an orbit that took about 24 hrs to do I lap of this other body. For Earth that's known as a geostationary orbit, which would be awfully close for a body the size of Mars. Io, the innermost large moon of Jupiter, has an orbital period of about 42 hours. Meanwhile Saturn's moon Mimas has an orbit very close to one Earth day. The Saturn–Purple Dawn scenario has the Earth, Mars, Venus and some other planets as "satellites" of Saturn. I haven't read Dwardu Cardona's books, but I've read several books that refer to Cardona's work. This relationship with Saturn is "demonstrated" by similar axial tilts, while Jupiter, Mars and the Sun share a similar axial tilt. I don't know if there's more, or if the axial tilt is sufficiently compelling to make the case. But here's the interesting thing: Mars (and the other bodies accompanying Saturn) were believed to be in-line with Saturn's axis, not orbiting around Saturn. This would more easily explain the north-south EDM of Mars as Saturn entered the Solar neighborhood. Upon escaping this other body the 24 Hr rotation would continue. And Mars and Earth might have interacted sufficiently to bring their roatations to the same amount, nearly. Now this just sounds like hand-wavium. Why would Earth and Mars have to "interact" if Mars was already rotating at 24 hours? There at untold theories about planetary interactions, but this is not the place to go into them. Why is this not the place to go into them? Unless you mean it simply has nothing to do with the thread subject, Iapetus? But there are geological clues that help us form theories, like the layered sediment on Earth. Geology had mechanisms for sedimentation long before people started hypothesizing interplanetary interactions. Metryq wrote: while Jupiter, Mars and the Sun share a similar axial tilt. Mars does not share an axial tilt with the Sun, but rather with the Earth. With the exception of Venus and Uranus, the planets axial tilts can be put in two groups. The Sun group (0 to 7 degree tilt) and the Saturn group (23 to 28 degree tilt). nick c wrote: Mars does not share an axial tilt with the Sun, but rather with the Earth. Sorry, I meant Mercury. I think the cat was head-butting my ankles at that point, and one "M" planet became another as my fingers went on automatic. Mars would have to be part of the Saturn gang to get that north-south burn. I'm just pointing out that good alternative theories exist and being firmly set on one is perhaps not a good idea. That and speculative theories are supposed to be in the 'New Ideas' section. However Nick, the moderator, has not growled yet so I continue a little. So if it was planetary interaction then their theories would be rubbish. Layered sedimentation is a fascinating subject and all the sediments could have been deposited in a few events. The theories are endless. moses wrote: I'm just pointing out that good alternative theories exist and being firmly set on one is perhaps not a good idea. Thanks for the tip, but when did I fixate on one idea? I mentioned two models (Saturn–Purple Dawn and Tom Van Flandern's fissioning) outside of the establishment's nebular hypothesis. You suggested that my theories clashed, as if I had one idea or one theory. leo vuyk wrote: ... Hyperion could be an old comet nuleus! More likely a giant lump of pumice? The biggest planetary ring in the solar system is much bigger than previously thought, say scientists. 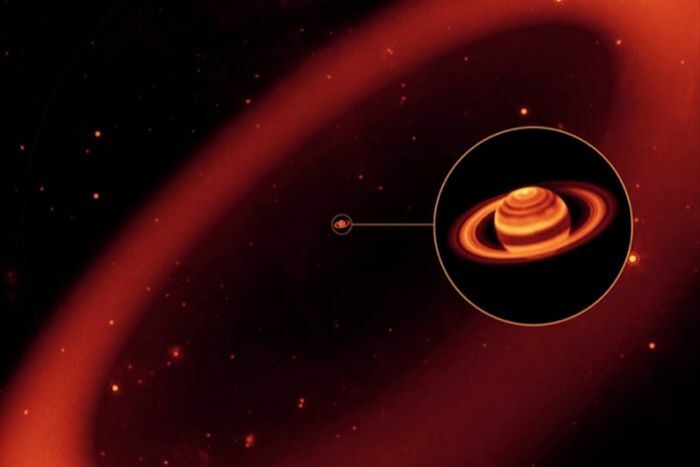 A new study, reported today in Nature, has found that Saturn's outermost ring is nearly 300 times the size of the planet it orbits. "Nobody expected [planetary] rings to ever be this large," says lead author, Professor Douglas Hamilton of the University of Maryland. "The textbooks all say that rings are small, located close to their planet." Saturn's largest ring was originally discovered by Hamilton and colleagues in 2009, and is named after the Saturnian moon Phoebe, which is the source of the particles that make up the ring. In the previous study the ring was detected between distances of 128 and 207 Saturn radii, but new measurements using NASA's WISE spacecraft have given the researchers a better picture and increased its size by 30 percent.